Boundless cover, and all other images, via Drawn & Quarterly. 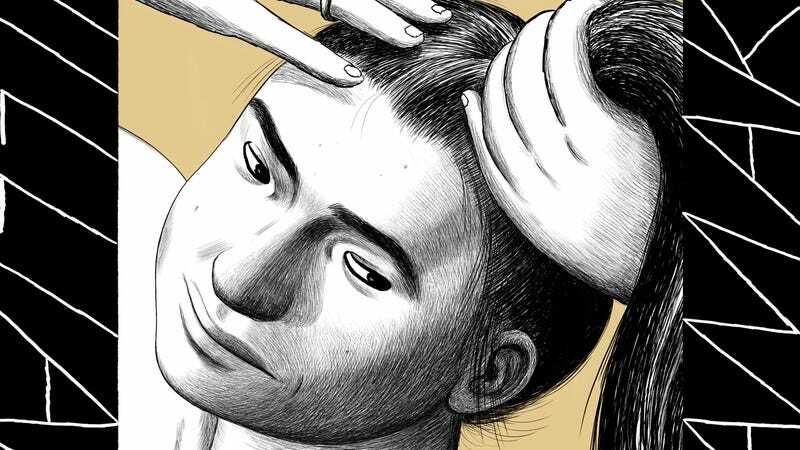 Boundless, a new collection of stories by the Canadian cartoonist Jillian Tamaki, refracts the world into strange miniatures. Helen inexplicably shrinks down to sub-atomic proportions, more bemused than alarmed; Jenny starts following a doppelganger on the “mirror Facebook,” consumed with parasitic envy towards herself. Fan and creator watch subcultures take form. The withering comedy of that line brings to mind SuperMutant Magic Academy, Tamaki’s previous book, whose teenage heroes spent more time squabbling or indulging delusional self-regard than honing their powers. She’s always been fascinated by the distance between our inner desires and surrounding reality. Tamaki is from Calgary, her extended family scattered across Canada—an Egyptian grandmother used to run nightclubs in Montreal, performing as a belly dancer. She’s collaborated with her cousin Mariko several times over the past decade, which began when a Toronto zine publisher wanted to pair up a writer who had never scripted any comics with an artist who’d never drawn them. In This One Summer, the latest young-adult book by the Tamakis, the brushstrokes of Ontario forest gave tween confusion an elusive frame. Boundless’s title story abandons human perspectives entirely, imagining the voice of a common housefly: “There are many dark corners to which I can retreat and live in peace. However, the simple act of moving creates a noticeable and irritating noise, which inevitably attracts attention in this quiet and serious world.” The deliberate variations of these comics might explain why Tamaki asked to talk via email. JEZEBEL: I was struck by how you placed “World-Class City” at the beginning of the book—you’ve made comics like that before, where the images are abstracted from the text, but I like leading off a bunch of short stories with a non-narrative piece. Did you have a certain effect or framing in mind there? Were the words written as a lyric? JILLIAN TAMAKI: It was placed there mostly due to the format—the story is printed sideways to achieve a “continuous flow” effect. The story “Boundless,” which appeared on the Hazlitt website as an infinite scroll, is presented similarly sideways. It was [Drawn & Quarterly editor] Tom Devlin’s idea to put them as the first and last story. Perhaps the physicality of turning the book is annoying or interesting? Like entering and exiting a space. Most of your last few books have used a single aesthetic, whether it’s the “polished” style of Skim and This One Summer or SuperMutant Magic Academy, which is like a sketchbook, a journal. But Boundless has the candied colours of “Body Pods” and “Darla,” the spidery, densely tangled lines of “The ClairFree System,” a couple of looser stories, ones that resemble your collaborations with Mariko Tamaki... How did you decide to sequence them? And when do you figure out what form a comic might take? I never expected the variety of styles to be such a point of discussion but I have spoken about it frequently! To me, one of the interesting things working on shorter things is establishing an aesthetic framework. Something like SuperMutant Magic Academy is a fairly pure expression of my handwriting—very direct and workmanlike. With these short stories, I was more interesting in mining the potential of the images. One thing uniting the stories is this idea of a parallel existence or subculture, sometimes on multiple levels—like, there’s Body Pods the movie (I thought of all those weird Canadian tax-shelter films from our youths), and the Body Pods fandom, a skein passing through the main character’s relationships. Has that theme been on your mind for a while? I suppose being in the comics scene, you’re subject to fandoms and a subculture even if you’re not directly in it. I have a lot of friends who work in animation on Very Popular Shows and it’s fascinating to see how they have to handle that. There is this thing that can happen where the piece of the Thing (the book, show, meme, whatever) becomes divorced from its creator and lives its own life. Several of the stories touch upon that idea—“SexCoven,” “Darla!,” “BodyPods.” Original intention, context, meaning, author, et cetera, can be made fairly irrelevant. I guess this is more of a statement than a question, but I love how “1.Jenny” inverts the way people normally get caught up inside social media: rather than obsessively following a crush, her nemesis, or the other woman/man, Jenny is monitoring... herself? Sort of? It becomes one and the same. I guess I’m acutely aware and am constantly questioning my motivations whenever I engage with social media which, to be clear, I still love. I think The Internet is presented quite neutrally in the stories–it’s just the medium we’re swimming in. It can be abused or used beautifully. I have a theory that social media can be a powerful tool in traversing a transition from one state of being to another. ﻿We view all this culture as garbage, but isn’t garbage quite enlightening?! And then “SexCoven” goes back in time, capturing the elusive mystery of the early Internet. Have you ever become fixated on something like that yourself? The overlapping media-collages suggest how these weird online phenomena can emerge by accident, a dead end with no explanation; some people are already worrying about how to preserve digital video/music, because the technology degrades into obsolescence so quickly. A fragile film print actually lasts far longer than a hard drive. Yes, I find the efforts of Rhizome, which aims to preserve digital art/spaces/etc to be very interesting. We view all this culture as garbage, but isn’t garbage quite enlightening?! I was 14 years old when my family got the Internet (Prodigy), and it was tremendously exciting. The severe limitations created a very mysterious, anonymous, experimental atmosphere. I remember Radiohead’s site was just a labyrinth of strange links to other strange links. “SexCoven” was an attempt to recapture that sensory emotion. I’ve also been using the term “techno-nostalgia,” ha. What you said about the Thing becoming divorced from its creator... I guess the ultimate nightmarish example is Matt Furie’s Pepe, but I’ve spoken to friends with much smaller audiences who fear a fandom turning against them if certain expectations aren’t met. Do you approach some comics differently, knowing that they’ll end up in hundreds of school libraries (and challenged at a few)? I don’t think the books I make are quite primed for fandom. I don’t think I have very much interest in world-building. Even SuperMutant Magic Academy, while I saw some cosplay or fan art when it was running on Tumblr, feels like a closed system to me. As far as challenges go, I/we rely on my publishers and librarians to figure out what is appropriate. The title of “World-Class City” is so abjectly Toronto—did you draw it before or after moving? Do you feel like the parallel-worlds theme was a response to getting displaced in that way? It’s definitely about New York and not Toronto! I wrote that one before I moved to Toronto in 2015. But it really is about any metropolis. Not sure exactly what you mean by “parallel world”... if you mean the images are not literal, well, that’s true. They were extrapolations of small drawings, doodles even, I made at that time of transition. I read somewhere that the drawings of “The ClairFree System” were adapted from existing sources, which gives them such an uncanny quality. Had you ever used that technique before? Where do you go looking for images? The images in that story, like “World-Class City,” were adaptations of existing images. Found photographs and sculptures in the [Art Gallery of Ontario]. Not straight copies, but adaptations or extrapolations. I can’t think of specifically using that technique but collage has always been present in my work. In the stories, however, I think the collage just forms the basis—the actual images are quite polished. I think the entire book has a collage-y effect. Do you ever hear from people who grew up reading the YA books like Skim and tracked down your other work? Yes, all the time. It’s quite incredible to hear people tell me that Skim “helped them in junior high,” when they look like fully-functional adults! You mentioned your theory that social media can be a tool in traversing from one state of being to another... could you elaborate on that? I like how the two Jennys in that story have an inversely symbiotic relationship: When one of them is happy, the other’s frustrated. I guess when I was feeling very displaced or “in transition” from one home to another, I felt the online space was a very comforting constant. Same with running. A headspace that remained the same as my whole world was changing. I am also very interested in how Instagram appears (?) to play a therapeutic role for some people. In terms of accepting their body or trying to self-improve or understand illness or track personal progress? Of course I’m just a viewer, so I only am privy to the “performance” or externalization. Ludwig Wittgenstein has this famous line, one of his brain-scrambling paradoxes, that argues: “If a lion could speak, we could not understand him.” Is the title story of Boundless a response to that question, an attempt to get inside this alien consciousness? Or did you just want to draw some of the squirrels roaming around Toronto? That story is about wayfinding and how we all move through the world. We have a hard enough time, apparently, understanding each other’s motivations and viewpoints, let alone a lion’s or squirrel’s. I think the current cultural moment is amazing and full of potential, as well as fear and pain, as we try to wrestle with global consciousness. I think we’re all pondering the meaning of borders, laws, order, as well as empathy, these days. Chris Randle is a Canadian who lives in New York. He’s written for places like Hazlitt, The New York Times Magazine, Artforum, Pitchfork, and Real Life.